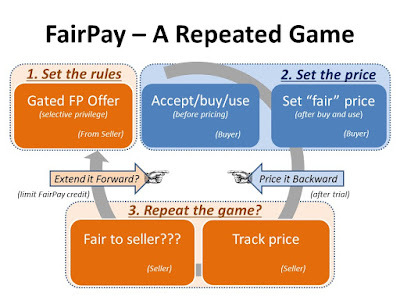 Most of the focus of FairPay is on a balanced use, as a repeated game in which the buyer has full power to set the price after each cycle of experience, but the seller maintains equal power over the pricing relationship by continuing the game to offer ongoing experiences only if they judge pricing to be sufficiently fair (referred to below as Full FP (Revenue-Gated) Mode). The criteria for fairness can be as strict or lenient as the seller wishes. I have recently been working with a startup company that is working toward introducing FairPay pricing for their new service (details on that to follow). That collaboration has led me to some interesting ideas on how you can best phase FairPay in, to get some basic functions at low cost -- and to learn a great deal about your market, so you can better manage your investment and your risk -- and improve your business overall. key questions about FairPay are how hard is it to integrate with your pricing systems, and to what extent might it put revenue at risk? 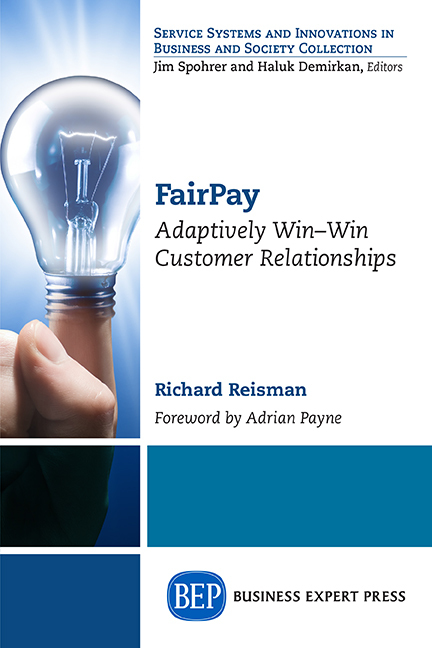 key benefits of FairPay are as a learning process, centered on dialog with your customers, about what they want from you, and how they value it. Here is a way sellers can begin to get the benefits, without incurring much of the cost, and none of the risk. The idea is to use FP in a startup mode to provide ongoing on a “free trial” basis, while a new service is in a “provisional use” mode, and then, after that, to phase in use of the full FP feedback and control processes. This approach is especially suited to new lines of business where the value proposition may be uncertain or temporarily limited (such as beta tests, pilots, etc.). Limitations may be due to lack of system function or lack of critical mass network effects, such as those affecting content richness, community participation, etc. This provisional use of a subset of FP processes can be beneficial, even before full use of FP is pursued. This opportunity may be common to many startup businesses, or to new services within existing businesses. It can also be applied in existing businesses by taking services that had been in a standard service tier, and shifting them to a premium tier on a trial basis. o The initial objective is to serve as a learning platform, apart from any revenue generation, to obtain customer “survey” data related to the potential value of the service. This role can integrate with other customer feedback to focus on the perceived value exchange, to better understand the benefits and problems in using the service by the consumer -- both reflecting the current state of the service (and its content and community), and looking forward to what can be expected when it matures. 1. to simply say what they “would” be willing to pay without actually making any payment (No-Payment Survey Mode),. o A secondary objective is to set the stage for Full FP (Revenue-Gated) Mode use, by facilitating learning by both customers and the service provider on how FP is best applied to the particular services. This would educate customers on basic concepts of the FP process, and help the service provider learn where to apply FP, how to frame offers, how to suggest prices and assess fairness, and the like, in the context of their particular services and customer base. o To aid in customer understanding, it might be clearly stated that FP is currently in Free Trial Mode for some or all services, and that a future transition to Full FP Mode was planned. These modes can be enabled before a full FP system infrastructure is built, since they require none of the real time feedback analysis, buyer fairness reputation rating, and reputation-based offer gating of a full FP service. Thus this level of FairPay requires modest development investment. · As the service matures, the Full FP (Revenue-Gated) Mode can be completely implemented and gradually turned on--with any desired phasing as to customer segments and service categories. Full FP (Gated Revenue) Mode would enforce FP “fairness-gating”-- limiting access by buyers that develop a reputation for failing to pay fairly. This can overlap with continuing use of FP Trial Mode for other customers and/or other service categories. o The shift to FP Gated Revenue Mode might be related to achieving a level of maturity as to service robustness, critical mass scale (in content and/or community), initial education of customers on FP concepts--and to scale-driven needs for revenue. o This shift can be phased in (sector-by-sector, if desired), using an appropriate change management process. Customer communications and dialog can be applied to prepare customers for this change (to include customer reputation rating and gating of offers), to identify any issues or concerns and ensure that they are recognized and addressed. It would be made clear to users that gating was being activated, why the time for that was right, and what changes to expect. The result of this staging approach is that FairPay can begin quickly to create a lightweight dialog with customers about value, and to generate valuable data long before it is integrated into actual payment processes. 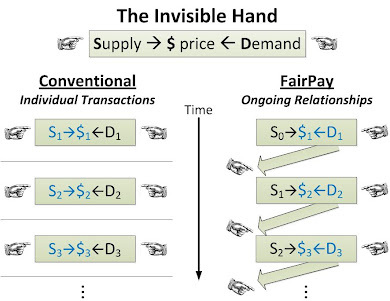 In this way it imposes minimal burden on customers, and also allows the development work of building the full FairPay infrastructure to be phased. Composing ATS is so natural on the off chance that you take after some run the show. In the event that you need to compose a quality full ATS , then you have to make it simpler but this https://www.rewritingservice.net/our-rewrite-my-essay-generator-for-your-needs/ website is the best option for them.